Where can I find the codes I need to place a Post-Picture Day order? You can find the information in the middle of your preview sheet. The information needed for reorder will be the Athlete Passcode, Record #, and Security Code. Where can I find the codes I need to place a Pre-Picture Day order? In the top-center of your order form, under your school, league or organization name will be the Picture Day ID number that you will need to place your order. What does the message "You have exceeded the number of times allowed to register for the website" mean? We are extremely conscious of security on LifetouchSports.com. The login process was designed to ensure that only authorized individuals have access to athlete images. The claiming process is authenticated based on information provided on the package insert sheet. If information is entered incorrectly, or if someone else in your family has already registered, the message described above would be displayed. If you feel that you've reached this message in error, please contact customer service at 800-244-4373. What if I have multiple children who attend the same school, league, or organization? Before Picture Day, you will need to order and pay for each child's portrait package in separate transactions. After completing the first order, click the "Start Another Order Button" on the last page, or simply return to the homepage to start a new order for the additional child. After proofs sheets have been received, multiple subjects can be claimed to a single registered user account. To claim additional children to your account, click the "Claim Additional Portraits" button. Enter the additional Athlete Passcode, Record # and Security Key in the "Claim Additional Portraits" window that appears. Click the "Add Portraits" button and the next child will appear in your account. This action can be repeated as many times as necessary. What if I don't have the needed information to claim my Child's image? Security is very important to us. We only allow authorized users to access athlete information. If you have misplaced your package insert, contact customer service at 800-244-4373. I received my LifetouchSports order and the contents are damaged. With Lifetouch your satisfaction is guaranteed. If you order was received damaged you can contact customer service at 800-244-4373. What is the Digital Image Download Offer? 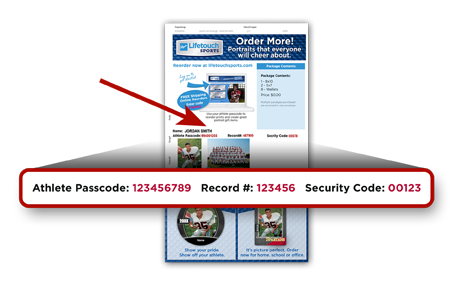 If you pre-ordered online on July 1, 2013 or later, you are eligible for the free digital image download offer from Lifetouch Sports. The digital portrait eligible for our promotion is a low resolution image of your child. 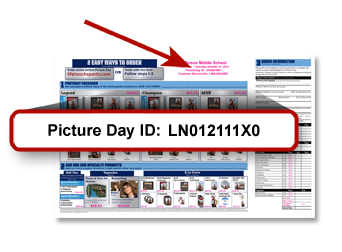 Lifetouch Sports sends an email with the Digital Image Code that enables you to download the portrait taken during the Sports Picture Day eligible for this offer. You can expect this email from Lifetouch after you receive your portraits. Our low resolution digital images are suitable for emailing, social networking sites, smartphones, etc. Please note that low resolution images (240x300 pixels) are not suitable for photo printing. If you do not have an account: Complete the "Register and Claim Your Portraits" section at shop.lifetouchsports.com and add the Digital Image Code when registering for an account. You will also need to enter the codes to claim your portraits. These codes will be found in the email, or on your Proof Sheet. You already have an account, but have not claimed the athlete's portraits online: Login to your account and click the "Claim Additional Portraits" button. Then enter your info in the window that appears. You will need to enter the codes to claim your portraits, which can be found on your Proof Sheet or in the email containing your Digital Image Code. 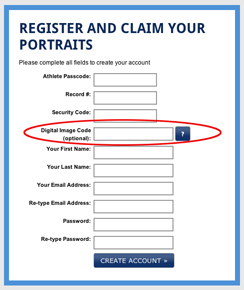 You have already claimed your athlete's portraits online: Click the "Add Digital Image Code" button. On the "Add Digital Image Code" page that appears, enter your Digital Image Code in the field that appears beneath your athelete's image. To download an image, click the "Download Digital Images" button. You will be directed to a screen where you can begin your image download. Athletes don't want a temporary blemish permanently displayed on their portrait. This service will soften harsh blemishes before printing. The result is a portrait far superior and much more satisfying to athletes and parents. 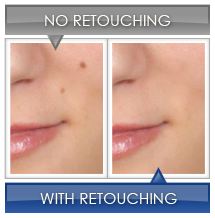 Please note that retouching may not be available for all schools, league or organizations. A notice is sent home with each athlete prior to Picture Day indicating the day of photography. If you lose your Picture Day flyer, a replacement can be picked up in the school office. What if I don't like my pictures? With Lifetouch, your satisfaction is guaranteed. If you are not pleased with your finished pictures you may return them for a full refund within 30 days of when you received your package. If you have questions or concerns call customer service at 800-244-4373. What is Copyright Release? Can I copy my pictures? Lifetouch Inc. is the owner of the copyright of the portrait. This is the policy mandated by the federal copyright laws. The copyright to an image can be transferred only through written permission from Lifetouch Inc. An understanding between Lifetouch Inc., the school, league, or organization and publishers of yearbooks and other school, league, or organization related uses allow such reproductions. If you do not want your child's portrait reproduced in any school, league, or organization publications please contact your school, league, or organization administration. If you wish to purchase additional portraits click here. Your package information sheet is required. What if my package is incorrect? Click here to submit your correction. You will need the code from your preview sheet to submit your question. What if I would like to order more pictures? Click here to order more portraits. Your package information sheet is required. I forgot to send money on Picture Day. Can I still order? Yes. Click here to order portraits. We ordered multiple packages - can they be delivered separately? We understand that some families would like to order multiple packages for parents and relatives. With Lifetouch, each package can be delivered in a separate package envelope with a customized insert indicating who the package is for. Please notify your photographer on Picture Day and he will make sure that your package is sent to the proper location. ©2016 Lifetouch National School Studios Inc.